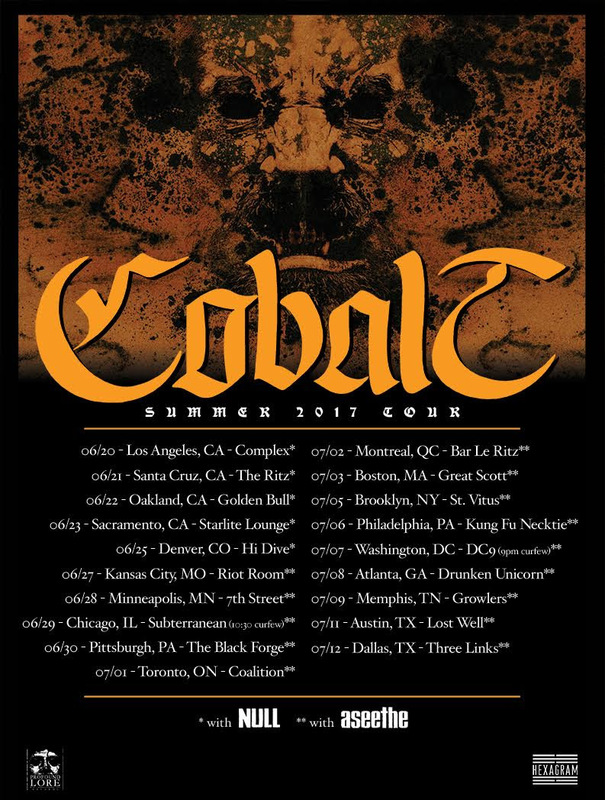 Colorado-based progressive apocalyptic wasteland metal duo, COBALT, will take to the streets this June on a near-month-long headlining tour. Set to begin June 19th in Phoenix, Arizona, the journey will pillage its way through twenty-two venues coming to a close on July 12th in Dallas, Texas. Support on the first leg comes from Alabama-based doom and gloom bringers Null, while the second leg features support from Iowa sludge unit Aseethe. See confirmed dates below. Comments COBALT multi-instrumentalist/mastermind Erik Wunder, "We are excited to hit the road once again in the US this summer, along with other bands we have handpicked to join the wild ride across North America! It has been an amazing few years getting the live COBALT band together and running, and we have put together a show that is sure to exceed expectations for what a live COBALT incarnation is capable of. More info to be announced soon, see you all out there!" COBALT features Wunder and vocalist Charlie Fell (ex-Lord Mantis). The pair will be touring in support of their Slow Forever full-length, released last year via Profound Lore Records. Pitchfork named the record the band's, "best-ever," and, "as accessible as it is aggressive, with magnetic hooks, shout-along mantras, and sparkling riffs." Spin noted, "Slow... was born of isolation and betrayal, but it's music that was meant for concert halls COBALT deserve to fill; music that rewards both introspection and reveling in like-minded rapture." Stereogum gushed, "Slow Forever works because it's way vaster and meaner and more monolithic than almost any album I've heard in recent years. It's not an album that does things. It simply is. If you listen to it in the right frame of mind, it creates this whole visceral hell-world inside your head, and you can just go fold in on yourself and live there." Brooklyn Vegan hailed an album of, "brutal, thrilling contradictions; raw but refined, furious but contemplative, catchy but punishing, literary but lizard-brained. Metal or not, it's one of the best albums of the year," giving it the #2 spot on their Top Albums Of 2016. Added Metal Injection, "Slow Forever is a commanding and magisterial composition. It stands as a frame of reference for great metal much like its predecessor and transcends the hitches and missteps that COBALT has dealt with in the space between albums... a massively rewarding experience to digest and rife with some of COBALT's greatest individual moments."